Bellydance is an ancient form of dance that has been performed by women for centuries as ritual and art. Yet, the beauty of this dance has not diminished with time. It has become even more exquisite as its intricacies have changed and adapted to modern music and concept. Bellydance is a uniquely powerful and feminine form of dance. The movements are natural to the female body, although, in the beginning it may not feel that way. The process of learning to bellydance strengthens the core, abs, legs, arms and shoulders while increasing heart rate and burning calories. It improves the body while teaching grace, femininity, and strength. Beginning a bellydance class can feel intimidating, but most people begin class with no dance experience. It takes about six weeks for the body to respond the way you may want, but it is worth the effort. Bellydance varies in style from country to country and changes with music popularity and, even, pop culture. ArtFit offers two styles of bellydance. We base our beginner class in the fundamentals of Egyptian dance. We believe that understanding the dance in its traditional form is the basis of all good belly dance, classical or modern fusion. After establishing the basics, you can explore classical Egyptian Bellydance, modern tribal and tribal fusions styles, and find your own personal dance style. Our beginner classes focus on body awareness, posture, and basic movement. This class is for everyone, and no experience is necessary.We start with fundamental body mechanics and turn it into beautiful fluid movement. You will learn the basic movements that are inherent to bellydance and that will provide you with the tools that you will need to begin to dance. We continue challenging our student with intermediate and advanced classes. Our intermediate classes are an introduction to the different styles that we offer. We will explore the concepts and movement inherent in each dance style. Advanced students focus on performance-ready curriculum. This level explores the Concepts of Dance that are found in all powerful and intriguing dances as well as prepares the dancers for performance opportunities. At AtFit, we strive to offer bellydance to women in Lubbock as an activity to improve your health as well as an opportunity to participate in an art form that women have been sharing for centuries. Our beginner classes focus on body awareness, posture, and basics. This class is for everyone and no experience is necessary.We start with basic body mechanics and turn it in to beautiful fluid movement. You will learn the basic movements that are inherent to bellydance and will provide you with the tools that you will need to begin to dance. Come learn how to dance and relieve stress. This class covers beginning Belly Dance moves, the base movement for all belly dance styles and beginning zilling. Egyptian style bellydance is recognized by it’s elegant and graceful movement coupled with intricate hip and torso isolation and perfectly placed accents. This style has been heavily influenced by the body placement and staging of European ballet and the intricate and orchestrated style of classical Egyptian music. It is the culmination of centuries of indigenous dance, orchestrated music and European influence. The result is elegant, fluid, and feminine movement that is exalted by the intricacies of classical Egyptian music. (Intermediate level) This class takes you beyond the basics, and introduces you to the glamour and excitement that is the “Egyptian” style bellydance. Students will not only learn a variety of increasingly more complicated combinations, and choreographies, but will also begin an in-depth study of movements and concepts unique to Egyptian dance. Layering movements, combinations, Egyptian style arm work, and historical information create a comprehensive curriculum that is challenging, fun, and informative. The advanced Egyptian style bellydance class is designed to be inspiring to the ladies who have conquered bellydance movement and have a basic understanding of the style. This class teaches more intricate combinations and movement while striving to perfect these skills. The focus of the classes, however, is the techniques involved in effective improvisation, helping students explore their personal dance styles, and an in-depth understanding and presentation of dance concepts. This is a performance preparation class that consists of advanced level movement, choreography, and zilling with a focus on soloing, music breakdown, stage presence and dance theory. This series of classes is full of information for the person who is truly interested in dance as a passion and an art form. It is presented in a fun and relaxed atmosphere that is as enjoyable to the hobbyist as it is to the serious dancer. The classes are formated to give the students exercise as well as a fundamental understanding of bellydance. 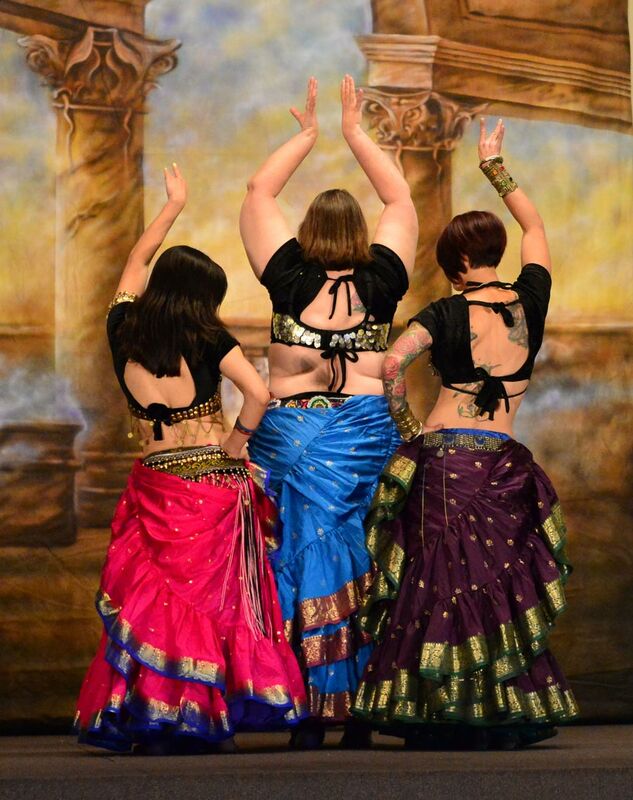 Many of our bellydance students continue with classes long term, as a part of their lifestyle, always finding new ways to move their bodies and explore dance. Tribal Dance was formed in California during the early 80’s. It is an Americanized version of Belly Dance that has the influence and feel of old eastern dance. It is an intermingling of movements from across the Middle East, India and Spain. This dance style was created for improvisational group choreography. Tribal fusion has an earthy and eclectic feel. Our Tribal Fusion style is founded in the American Tribal Style movement but with an updated twist. We also teach and perform the modern evolution of this style which has a modern Gothic fee that is reminiscent of performance art and is very popular with younger dancers. This contemporary branch of bellydance has a wide range of style and concept. The more traditional tribal style dance has an eclectic and old world feel. The modern fusion is more industrial and artistic. We explore the entire range of style and music, Tribal bellydance has something everyone will enjoy. This class introduces you to the world of Tribal bellydance. Tribal was originally created so that groups of dancers could perform together without choreography. This class begins to teach that process by introducing improvisational elements. Learn Tribal style movements, to cue turns and transitions, and lead a group. In only a few classes, students will be able to lead and follow, resulting in group improvisation. This class takes Tribal Dance to the stage. It teaches more complicated combinations and increases the degree of group work, adding elements of staging and formation changes. It consists of advanced Tribal movement, combinations, sword balancing, and Tribal formation. This class also begins to explore the world of modern fusion and gothic bellydance. These style require strength and stamina that students have been building throughout the prerequisite dance courses. Tribal fusion dance is formulated to provide a sense of community. All dancers must work together, in unison, to achieve the final product, a complete improvisational performance.